I've been obsessed with Harley Quinn since I was a little girl. I grew up watching the Batman cartoons and always loved how mischievous & cute she was. She has gone through what seems like a never-ending style evolution, with each new artist putting a spin on their predecessors work while creating a wholly new Harley each time. 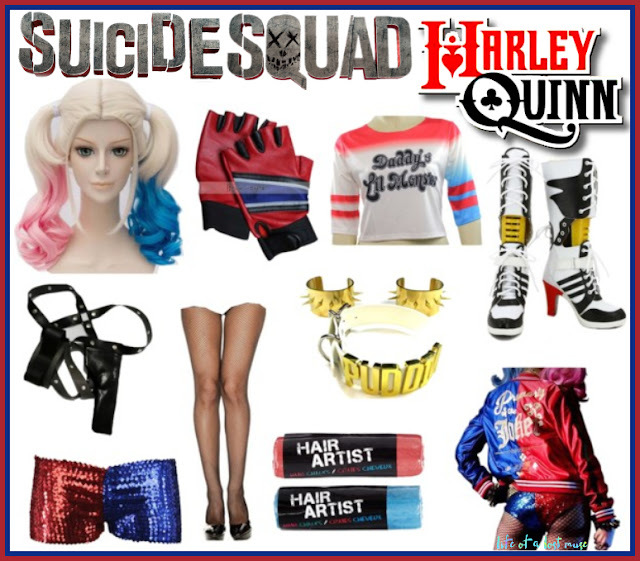 There are countless options for becoming Harley Quinn for Halloween or a costume party. Just pick your favorite! I'm currently infatuated with the upcoming Suicide Squad version of Harley, played by the incredibly gorgeous Margot Robbie. That woman was meant to be Harley on the big screen. So, unsurprisingly, I've decided to go as the Suicide Squad version of the erstwhile Harleen Quinzel for Halloween this year (along with like a million other people, probably). I've made a collage of all the things you need to complete your costume as well as where to find them. Now, let your freak flag fly and have some fun!